I understand the difference between k medoid and k means. But can you give me an example with a small data set where the k medoid output is different from k means output. k-medoid is based on medoids (which is a point that belongs to the dataset) calculating by minimizing the absolute distance between the points and the selected centroid, rather than minimizing the square distance. As a result, it's more robust to noise and outliers than k-means. A medoid has to be a member of the set, a centroid does not. Centroids are typically discussed in the context of solid, continuous objects, but there's no reason to believe that the extension to discrete samples would require the centroid to be a member of the original set. Both k-means and k-medoids algorithms are breaking the dataset up into k groups. Also, they are both trying to minimize the distance between points of the same cluster and a particular point which is the center of that cluster. In contrast to the k-means algorithm, k-medoids algorithm chooses points as centers that belong to the dastaset. 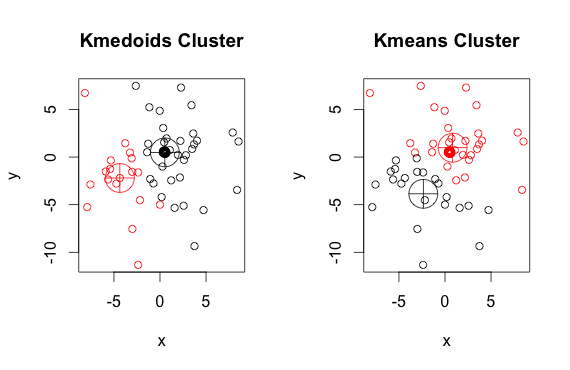 The most common implementation of k-medoids clustering algorithm is the Partitioning Around Medoids (PAM) algorithm. PAM algorithm uses a greedy search which may not find the global optimum solution. Medoids are more robust to outliers than centroids, but they need more computation for high dimensional data. Not the answer you're looking for? Browse other questions tagged k-means k-medoids or ask your own question. 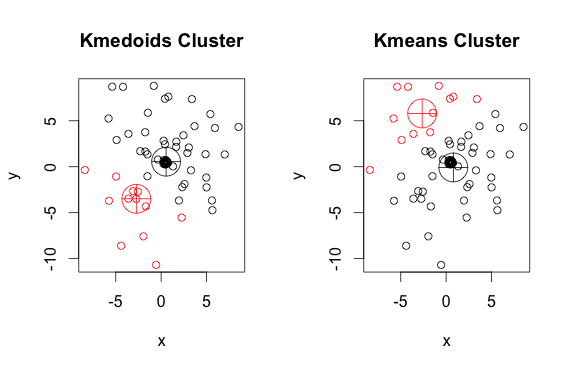 k-means clustering why sum of squared errors (why k-medoids not)? More consistent medoids from Lloyd's algorithm?